On New Year’s Day, CannaCruz dispensary CEO Grant Palmer saw 400 customers come through his business — almost all were recreational users. In a little less than a week after the year began, the local shop saw an 83 percent increase in business, a big enough jump in numbers to drive CannaCruz to hire four new full-time employees. CannaCruz isn’t alone. Other businesses that received cannabis retail licenses within the county are bringing in a new crowd of curious customers. Owner of Therapeutic Healthcare Collective and American Cannabis Nurses Association member Barbara Imhoff said her shop experienced an increase of about 60 percent in business within the first week. 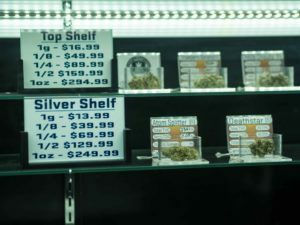 But Proposition 64 has brought more than just a growth in customers with the new year. Freshly trimmed marijuana sits in a bowl in the upstairs offices of CannaCruz. Dispensaries are experiencing an overwhelming increase in customers after the statewide legalization of recreational marijuana for residents age 21 and over. Between Dec. 5 and Dec. 14, 2017, 16 medical dispensaries applied for a cannabis retail license in the city of Santa Cruz, and more have applied within the county. Reefside Health Center, Wo/Men’s Alliance for Medical Marijuana and West Cliff Wellness were selected to join CannaCruz and KindPeoples — both of which were preapproved while city members developed the new ordinance for recreational cannabis — as recreational retailers in Santa Cruz city. Varying qualities of marijuana are displayed for customers to choose from at the CannaCruz dispensary. UC Santa Cruz sociology and legal studies Professor Emeritus Craig Reinarman, whose research interests include drugs in society, was KindPeople’s honorary first recreational customer of the year. Reinarman said these new fees and regulations may take a toll on smaller cannabis farmers and businesses. “Some of the more small scale, marginally profitable operations that were medical marijuana dispensaries will either broaden out to be recreational successfully or not be able to make the transition and there will be what economists call a shakeout,” Reinarman said. Since obtaining their retail licenses, cannabis businesses within the county are changing in a multitude of ways to comply with the specifics of Proposition 64. Some dispensaries opened in a new location or plan to, but many find it difficult to find a site that complies with the new state laws. For example, the business is not allowed within 600 feet of a school, daycare or youth center. 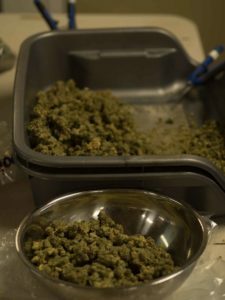 “The building we’re in was literally the only [available] building in the city of Santa Cruz that was appropriately zoned for cannabis, and so it was that building or not at all,” Palmer said. After businesses settled into their new shops, they had to quickly prepare for the new 2018 regulations. California’s Cannabis Track-and-Trace system, which follows product from seed to sale for safety reasons, is one of the changes dispensaries are adjusting to. The system requires an expensive new software, Barbara Imhoff said. Palmer stated that although he understands the need for regulation, he hopes there will be a decrease in fees and Prop 64 will eventually be amended to help not only dispensaries, but customers dealing with increasing product prices.